Oven Repairs Gold Coast. Have your oven problems addressed by one of our licensed electricians quickly and professionally. Whether you have an under bench oven or a wall oven our service vehicles carry a range of parts to solve your oven worries. Suburbs surrounding our workshop at Arundel – like Parkwood, Runaway Bay, Labrador, Biggera Waters, Helensvale and Crestwood Heights can normally have a repairman attend to their oven the same day or next business day. Other suburbs from Upper Coomera to Varsity Lakes will be 1-2 business days depending on booking volumes. Not sure if your oven is worth repair? Have it checked first by one of our technicians, if worse comes to worse and the parts are no longer available or it is not worth repair we can advise you on the best course of action. 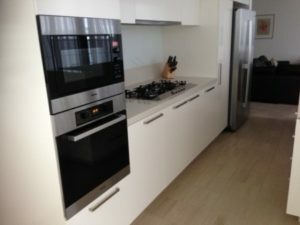 Our tradesmen have many years of experience updating kitchens to new ovens without needing to go to the expense of replacing your entire kitchen.